The box score from last night's Creighton-Villanova game—a game that ended with Creighton upsetting the No. 4 team in the country behind 21 made three-pointers—looks like a fluke. No team is supposed to heave 35 three-pointers in 40 minutes, let alone connect on 60 percent of them, right? Wrong. The Creighton Bluejays did exactly what they were designed to do last night, because the Creighton Bluejays are terrifying. More than any other team in the country, Creighton has embraced the power of the three-point shot. The team is built on the back of a quick-firing hydra made up of three seniors: forwards Doug McDermott and Ethan Wragge, and guard Jahenns Manigat. Their fundamental strategy is simple—bomb the hell out of the three—and it's turned Creighton's offense into the most deadly in the country. Creighton leads the country in three-point percentage (43.7) as well as overall offensive efficiency. According to Ken Pomeroy's metrics, Creighton's adjusted offensive efficiency is 128.2. This number means that after adjusting for various factors such as quality of opponents (far more necessary in college than the NBA), Creighton's offense scores about 128 points per 100 offensive possessions. That is a staggering number, and one that no team has come close to reaching in the past decade. The last team that was this efficient on offense was the 2005 Wake Forest team, which had an adjusted offensive rating of 124—and Chris Paul. Creighton owes all of this success to the three ball. It gets 41 percent of its total points from the perimeter, the third-highest mark in the country, and 45 percent of the total shots it takes are three-pointers. This isn't an example of an athletic team playing a classic run-and-gun style and playing the percentages, either. Creighton only gets 18 free-throw attempts per game, good for 325th in the country. And the Bluejays don't even play all that fast, either. Ken Pomeroy's adjusted tempo statistic ranks them as just the 213th-fastest team in college basketball. The good news for Creighton is that it hits a lot of these shots, giving it an effective field goal percentage (this adjusts for the increased value of a three-point shot over a two-point shot) of 59.5 percent, the best in the nation. Of course, none of this is possible without the skill and overall ballsiness of the hydra. 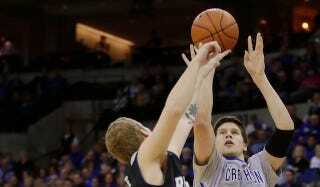 Creighton's offense starts with McDermott, the team's best player. McDermott averages 24 points per game and is hitting 44 percent of his shots from beyond the arc. His individual offensive rating is 122.3, the highest of any player in the major conferences, and he takes 37 percent of the team's shots while on the court. McDermott isn't just a bomber, though. He's also his team's leading rebounder, and can score in the post as well as from the perimeter. This feels almost ... holy, as if Wragge and Co. were some breakaway group of ascetics who decided to shoot threes instead of chant sutras. I can't wait to see what they do in the tournament.